EB&Flow is still a relatively new gallery (having only opened this spring) and one that I hadn’t previously visited. So, on my way to lunch with a friend in Spitalfields last Friday, I decided to meander down Leonard Street and take a look. Opposite Westland London, a wonderful and quirky reclamation yard, EB&Flow is currently exhibiting young artists Katie Louise Surridge and Dylan Culhane. EB&Flow, Leonard Street. Own photograph. 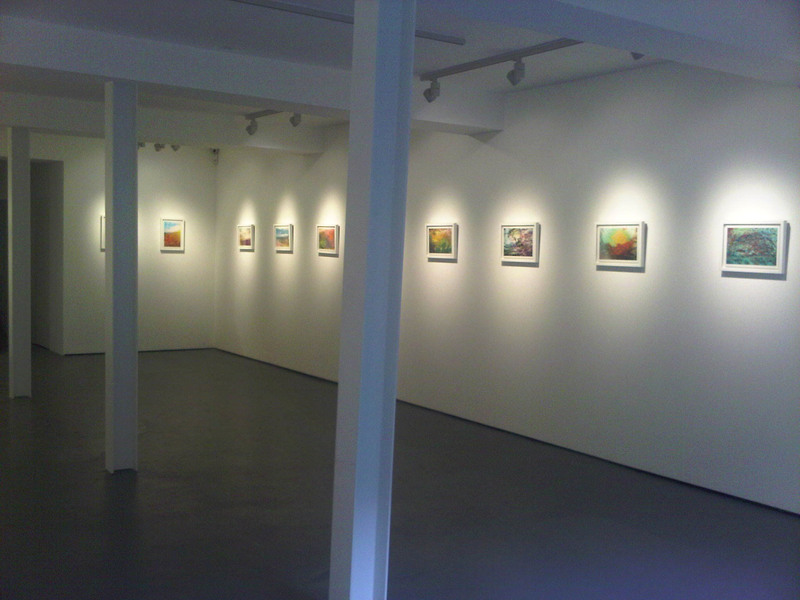 The gallery is lovely, a calming space in an old East End building. The painted grey floor boards are warming and give the gallery a satisfying acoustic (the click clack of my heels made wonderful reverberations). The directors didn’t want their gallery to be a cold sterile place and it isn’t. Surridge’s often large-scale installations play with found objects. Katie Louise Surridge’s work. Own photograph. Live Through This incorporates Victorian tobacco clay-pipes that she has scavenged from the banks of the Thames along with shire horse collars and a cattle feeder. The process of discovery is key to Surridge and her works develop as the found objects grow and form relationships with one another. Most of her works on show here incorporate elements of animal or botanical origin. In touch with nature, she is interested in exploiting textures, fabrics and materials. Often playing on the conditions in which animals live, the detail in her sculptural installations is fascinating. 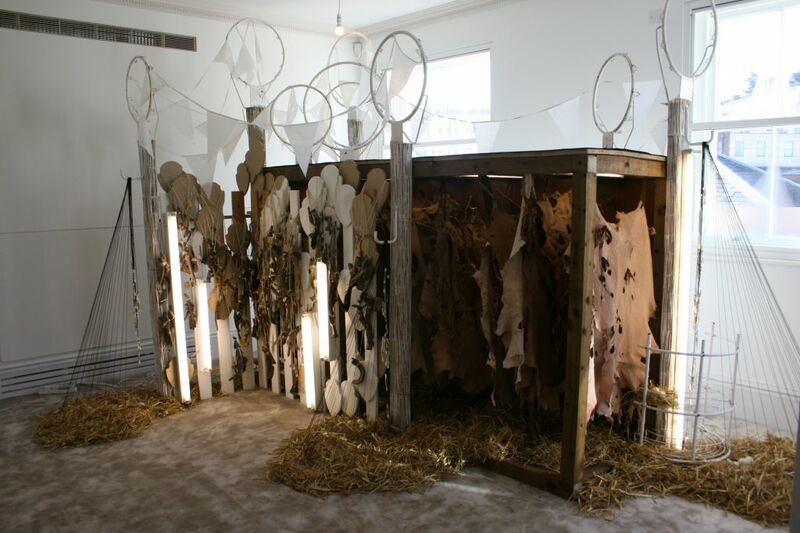 Katie Louise Surridge, So Over, mixed media ( including fence posting, skins, straw, bunting, roofing felt), 2010. Image via www.ebandflowgallery.com (and courtesy of the artist). I found some of the wall-based works quite strange – the birds and skulls aren’t really to my taste but, on the whole, the exhibition works well. There is a native rusticity to the gallery and the tactility of the works is inviting. One piece is reminiscent of a merry-go-round but with a raw edge. 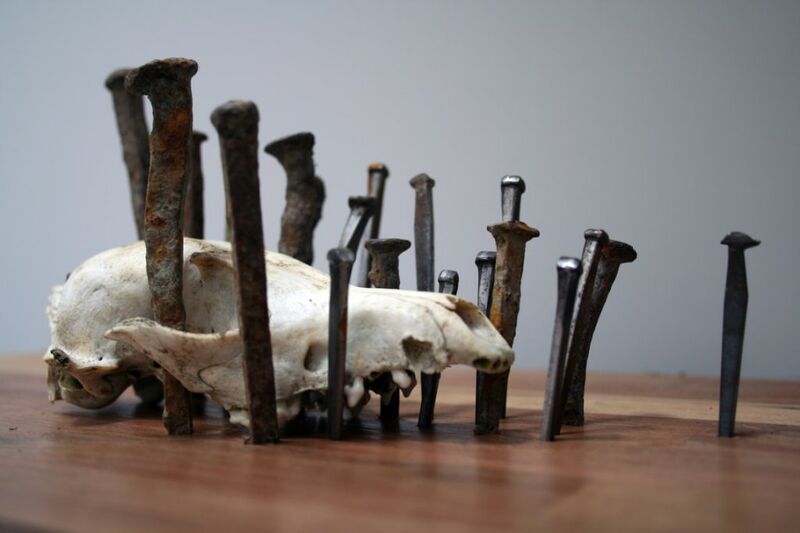 Katie Louise Surridge, Skull and Nails, mixed media (fox skull, wood, found nails) 2011. Image via www.ebandflowgallery.com (and courtesy of the artist). 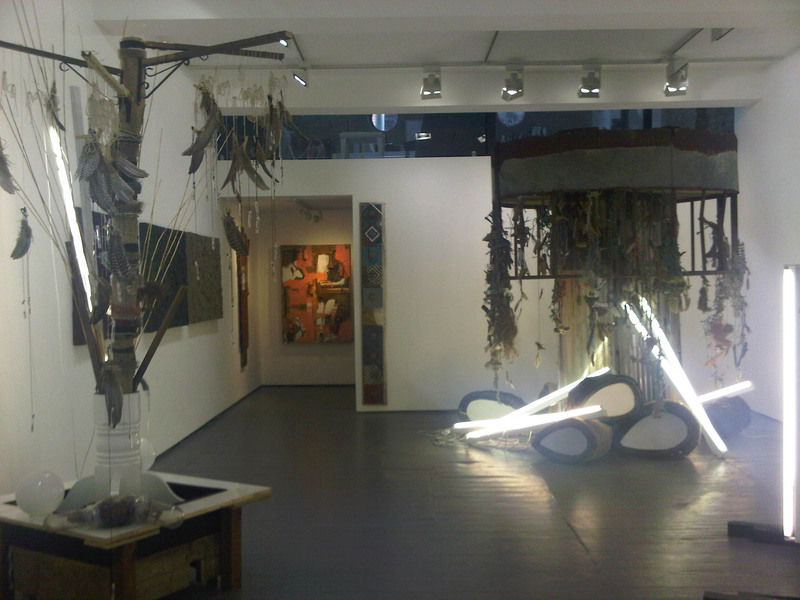 Culhane’s exhibition downstairs is more conventional. Dylan Culhane downstairs at the gallery. Own photograph. He plays with clever photography utilising layered multiple exposures. His works resemble painted canvases which present a striking contrast to the wilderness upstairs. Many of these works have been taken in or around Culhane’s native Cape Town. 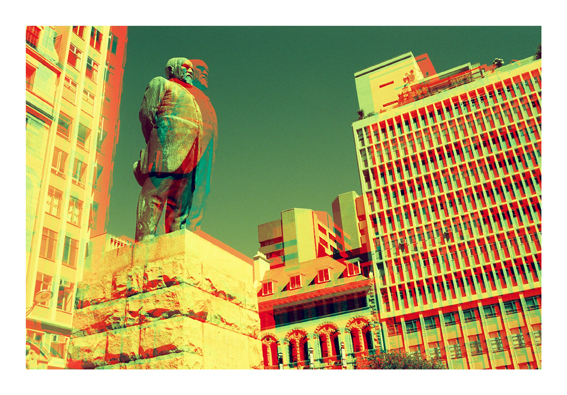 Dylan Culhane, Church Square, Cape Town, 2011. Image via www.ebandflowgallery.com (and courtesy of the artist). His unique representations of place push conventional photographic boundaries; beginning with geometric shapes as the exhibition progresses, the overlays become more adventurous blending with the original photograph and merging the juxtaposed layers. His works are almost illusionistic, transforming well-known landscapes and pushing the visual boundaries of his medium as well as the capabilities of his camera. 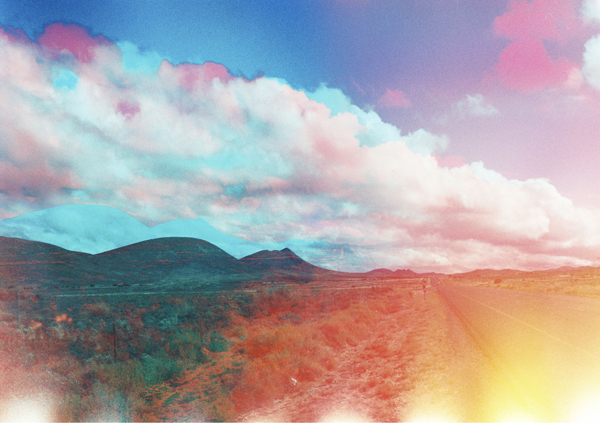 Dylan Culhane, U-Turn, South Africa, 2011. Image via www.ebandflowgallery.com (and courtesy of the artist). The space is great and, although I didn’t think the exhibitions were brilliant, they were interesting. This new gallery is already flying in its first year and I’m most interested to see what they do next. The sun was shining and, after lunch, having escorted my friend back to his office, I decided to walk down Brick Lane to the wonderful Beigel Bake. Carrying three dozen beigels (they freeze well and I’m not one to do things in halves), I set off for the tube. A note for anyone thinking this is a good idea – high heels, heavy bags of beigels and humidity is not a good combination and my poor feet blistered badly. I’m paying the price and salted ice footbaths have dominated my weekend in an attempt to ensure I’ll be back in stilettos next week! 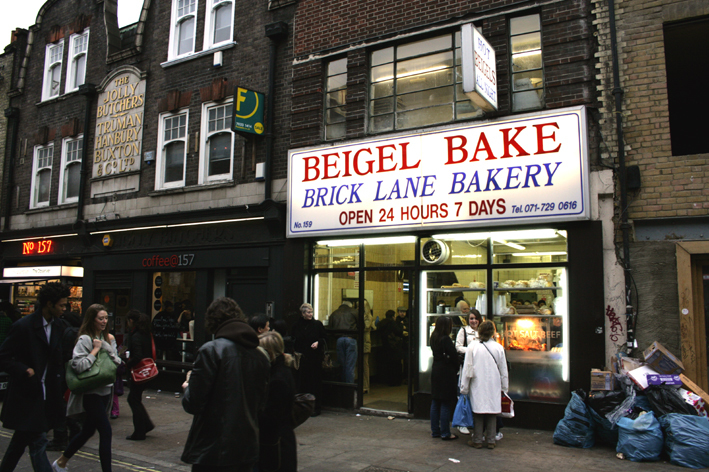 Beigel Bake, 159 Brick Lane. Image via www.britishfoodinamerica.com. 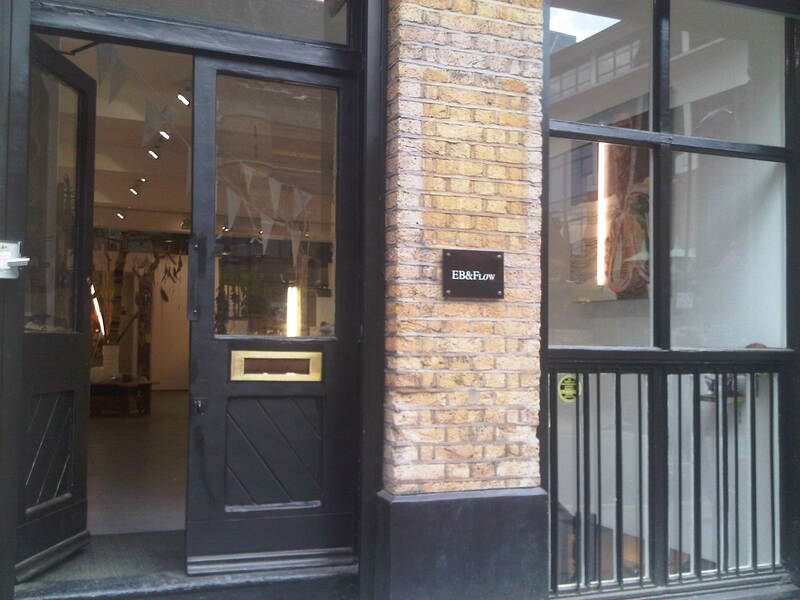 Katie Louise Surridge: Voo-dology and Dylan Culhane is at EB&Flow until 26th August 2011, http://www.ebandflowgallery.com.